Sweets for the Summer | Delicious! Summertime is almost here! Get ready to lay out by the pool or at the beach and enjoy the sunshine! While you’re laying out, there’s nothing better than a sweet treat to keep you cool. 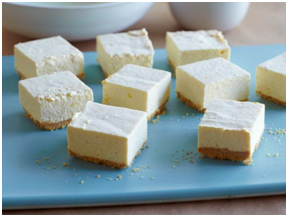 Check out a few of these simple summertime sweets! To make the crust, place graham crackers, pretzels, granulated sugar, and cocoa powder in a bowl and mix well. Add the cooled melted butter, mix, and set aside. Place the cream cheese in a stand mixer with a paddle attachment. Mix on medium speed to soften the cheese, about 1 minute. Add the peanut butter, powdered sugar, salt and vanilla paste and mix at medium speed for 4 to 5 minutes, and then increase the speed to high for an additional 2 to 3 minutes. The mixture will become light and fluffy. Add the peanuts and mix just enough to incorporate the nuts. Scrape the mix into a bowl and set aside. Clean the mixing bowl and add the heavy cream. With a whip attachment, whip the cream until slightly firm peaks. Be careful not to over whip. Fold one-third of the soft cream into the mixture. When the cream is folded in, continue with the remaining cream. Fill a pastry bag with the peanut cream and pipe a small amount into each mold. Tap the mold to ensure the mixture drops to the bottom of the mold. Sprinkle the chocolate balls over the mix. Pipe more mix, making sure to tap again. Sprinkle some crust and repeat with the cream. Continue layering the chocolate balls and crust. Insert the pop sticks into the mixture three-quarters of the way into the pop. Freeze overnight. Melt the chocolate and keep warm. To unmold the pops, dip the mold into hot water. Gently twist the sticks as you lift the pops out of the mold. 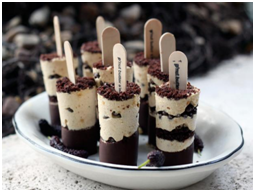 Dip the pops one at a time into the warm chocolate allowing the excess chocolate to run back into the bowl. Place the pops on a pan and return to the freezer. For the puree, blend together the fruit, sugar and lemon juice in a blender until smooth. For the yogurt, whisk together the sugar, yogurt and coconut extract. 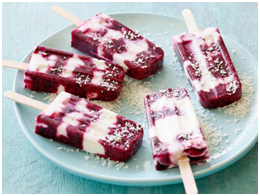 Pour alternating layers of the fruit puree and coconut yogurt into Popsicle molds, and then insert the sticks. Freeze until the pops are firm, about 8 hours. For easy removal, dip the bottom of the molds into hot water for a few seconds to loosen the pops. Remove the pops from the mold, dip in coconut flakes and serve. For the crust, place graham crackers in the bowl of a food processor and pulse until crumbs are formed. Add butter, brown sugar and salt and pulse to incorporate, until crumbs resemble wet sand. Coat an 8-inch square pan with cooking spray and pack crumbs firmly into the bottom of it. Refrigerate until ready to use. For the filling, in a large bowl, combine cream cheese, condensed milk and pasteurized egg product and beat on high with an electric mixer until smooth and creamy, about 2 minutes. Add lemon zest and juice and beat until fully incorporated, another 30 seconds. In a small bowl, combine the gelatin and boiling water and whisk until gelatin is entirely dissolved; let cool 2 to 3 minutes. Stir the gelatin into the cream cheese-lemon mixture until well incorporated. Pour the filling over the crust. Refrigerate for 8 hours or overnight, until filling is firm. ← Egg-stra yummy Easter treats!